Frank Bennett sits with his Goldendoodle, Shelby, in a sunny room in his Topsham home. Bennett, 68, was diagnosed with ALS, or Lou Gehrig's Disease, in 2014. TOPSHAM, Maine — Frank Bennett has spent the last five years working his way through a still-growing list that has included buying a Model A Ford, skydiving, multiple trips to the Caribbean with his wife and daughters, and proposing again to his wife of 46 years, Connie. In July 2014, the Bennetts’ son-in-law helped Frank get down on one knee to propose all over again with a special piece of “bling” he’d picked out and placed on the front seat of the Model A. 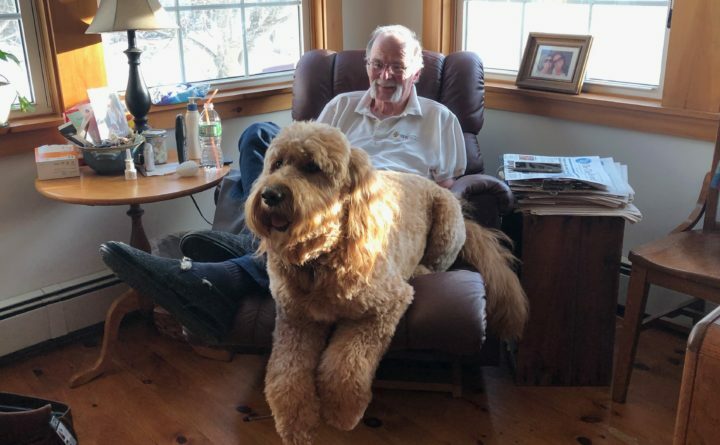 “I said, ‘If we could do it all again, would you still marry me?’” he said last week, sitting in a soft recliner in the afternoon sun, Goldendoodle Shelby nestled alongside his leg. A proficient woodworker, Frank honed his craft on almost every inch of the Cathance Road farmhouse the two share. On a recent Wednesday, he struggled to pick up a bottle of Poland Spring water with his right hand — “my left hand is useless,” he said — and maneuver a straw to his mouth. The magic in his fingers had been stolen by ALS, or Lou Gehrig’s Disease, a merciless, universally fatal neuromuscular disease that strikes just over 5,000 people in the U.S. each year and two people per 100,000, according to the ALS Association. Every six weeks, Frank, Connie and Shelby, visit neurologist Dr. John Taylor, director of the Mid Coast ALS Clinic. In April 2014, Taylor diagnosed Frank with ALS. According to Taylor, about 60 patients in Maine are currently diagnosed with ALS, which affects the nervous system, brain, spinal cord and eventually progresses to a patient’s arms and legs and impedes speaking, swallowing and breathing. “Patients go from [saying], ‘My foot doesn’t work so well,’ to dying in 24 to 36 months,” Taylor said recently. Frank was referred to Taylor in early April 2014 after a struggle with shoulder pain. He was 63 and preparing to retire later that month after 31 years as a salesman for Country Kitchen Bakeries. He’d only ever taken one sick day, Frank said. During his first visit with Taylor, before the many tests that led to his diagnosis, the doctor asked Frank to take off his shirt. Frank said Dec. 19 that he’s sure Taylor knew after that first visit, but instead of diagnosing him he told the couple to go on their planned vacation and that they’d “figure out what’s going on” when they returned. At the next visit, Taylor gave him his prognosis: “Two to seven years,” Frank remembered on Wednesday. Not long after his diagnosis, Frank began compiling a list of things he wanted to do and to do for others before his illness got too severe. Shortly after the diagnosis, Frank and Connie went to Bridgton to see Goldendoodle puppies. Instead, they met the breeder’s own 15-month-old Goldendoodle, Shelby, who walked over to Frank and crawled in his lap. “She picked me,” Frank said, then telling of one “bad” emotional day when he left the room because he didn’t want his family to see him cry. “She came in and licked the tears off my face,” he said of the companion that is now trained to accompany him to nursing homes, hospitals and doctors’ offices. Before the clinic was available, patients with ALS would frequently visit their general practitioner or a hospital emergency room for each specific symptom. In its first year, the clinic is the only ALS-associated clinic in the state, and draws patients from all over Maine. Taylor said he’s beginning to get referrals from Maine Medical Center in Portland. But now, on the second Friday of each month, the team — physical therapist Jennifer Anderson; occupational therapist Elizabeth Hyde; speech therapist Kristin Mason; nutritionist Kylie Fagnano; social worker Grace Plummer, who specializes in palliative care; Laurie McFarren, a representative of the Northern New England Chapter of the ALS Association; and “the quarterback,” RN Sarah Savard — gathers for a pre-clinic meeting. Then each clinician sees each of six patients for a half-hour each over the course of several hours, communicates with each other via written notes between the visits and then meets again after the visits to develop individual plans for the patients. While the clinic can’t offer a cure for ALS, it provides “a coordinated treatment paradigm,” Taylor said. One might need help transferring to a hospice, another might need a feeding tube. If their swallowing reflex is failing, Hyde, the clinic’s occupational therapist, might track down a communication device. Clinic nurse Savard has visited patients at their homes to help them learn how to use medical equipment such as suction devices and lifts. Taylor is now working on creating a “caregiver boot camp,” at which family members could learn how to use a Hoya lift, how to transfer someone to a bed, and expose them to medical equipment they may have to use one day. After the clinic visit, patients return to living their lives. One visited the Great Wall of China, Taylor said. While most ALS clinics are run through large teaching hospitals such as Dartmouth-Hitchcock and the Mayo Clinic, the Mid Coast clinic is funded through Mid Coast Hospital and the ALS Association, along with significant donations from various philanthropists, including Martin Teitel of Orland, whose late wife, Mary J. Harrington, died of ALS in 2010. Teitel and Harrington lived in Lincoln County when she was diagnosed. Teitel cared for her himself because his wife was determined to stay at home. “The only treatment that made any difference in her life was an ALS clinic in Boston,” he said. Coincidentally, Teitel also sees Taylor for treatment of myasthenia gravis, which Taylor diagnosed seven years ago in the Mid Coast Hospital ER. Teitel said Taylor confided in him at the time that his dream was to open an ALS clinic. Through a donation to the ALS Association, Teitel helped him do just that. Doctors have said the progression of Bennett’s ALS has been remarkably slow. In fact, his next-door-neighbor was diagnosed and died quickly, he said. Now, he’s having trouble breathing, particularly when he climbs the stairs to the master bedroom. In 2017, a former Brunswick High School classmate threw an early 50th reunion in Frank’s honor at the Bath Country Club. Seventy-five former classmates, from as far away as Florida, showed up. He was overwhelmed. Earlier this year, Frank began to lose weight rapidly after essentially losing his desire to eat. At one point he was down to 132 pounds, he said. One night during their conversation, Kathy said, “I know you don’t want to prolong what’s going to happen, but the biggest favor I have for you is to at least consider a feeding tube,” Frank said. “I thought about it and the next day, I called Celeste (Moreau, the manager of the neurology practice) and told her I’d changed my mind. As she’s talking to me on the phone, she was knocking on Sarah (Savard, the clinic RN) window” about the tube, and within one week, Frank was in surgery having the tube installed. “That girl (Sarah) is amazing,” Connie said. The “cohesiveness” of the clinic gives both Bennetts “a wonderful sense of security,” Connie said. Frank laughs until he’s short of breath, stops for a minute, and then smiles a quieter smile. “I’ve reached a point where it’s hard to think of anything to top [what I’ve already done],” he said. He’s also become very concerned about his right hand. Because his fingers have begun to drag on the computer, the clinic staff is fitting him with a new computer operated by his eyes, he said. “Dr. Taylor and Dr. [Dayton] Haigney at Togus always say, ‘Don’t worry about the suffering. That’s what we’re here for,’” he said. Still, he worries, and is very conscious of that right hand. Frank hopes Mainers will soon be able to vote on a Death with Dignity referendum, for which proponents are collecting petition signatures.